in historic downtown Kernville, California. Try our new VIRTUAL TOURS! We can accommodate groups from 2 to 24 people. NOT QUITE RIGHT?... ARE WE FULL? Try our affordable and cozy cabin just 12 miles up the mountain! Click here for the "Little Red Lodge"
Bringing your family or group to Kernville? We have 4 individual cottages, all on the same property, and all fully equipped. separate bedrooms for everyone, and a private patio with a barbeque. All this, and you're less than 2 blocks from downtown Kernville. NOW AVAILABLE.... WIRELESS INTERNET ACCESS!... FREE! - ONE block to shopping, museum, groceries, and anything else you need. "Hi Becky, I want to thank you for helping to save my family vacation. Due to unforeseen circumstances, my husband and I found ourselves in Kern County with three children under 7, my father-in-law, and no accommodations. You promptly returned my message for openings and we were in your East Tobias cottage by nap time. When we arrived we could not have been happier. We were walking distance to downtown Kernville and a beautiful drive from the 100 Giants trail. I am excited to visit your other properties. You can count on us sharing our positive experiences with our friends and family. -Ginny F., Oceanside, CA"
"What a lovely place, we will definitely be back!" "Great place to stay We loved our time there and will definitely be staying again Really nice"
"Recent 5 day get away during our 5th visit to Carl's property.Stayed again in East Tobias. It has turned out to be our favorite of the rentals because of the front shade trees and good ventilation front to back. Unit was nice and clean on arrival and had what we needed for a relaxed visit. Couches are comfortable and the firmer mattress provides a good nights sleep. Love the quaintness of town, walking distance to shops, restaurants (Pizza Barn and El Rio have good food) if you don't want to cook.Grocery is not far for supplies.Nice that the Kern River and park area are in town for fishing, walks or sitting and relaxing. Residents are friendly and we strolled the Serrita St 32nd Annual Yard Sale for some interesting browsing. Carl is very prompt with emails during the reservation process and any questions you might have. We will be back here to one of our favorite getaways. " "Hello Carl! Just thought I�d touch base with you to let you know we had a great time at your cottages. They were the perfect accommodations for our group. Thanks for being so wonderful to work with! We will definitely recommend your cottages for any other groups that might inquire. Have a great weekend! Sincerely,"
"Hello Carl: A quick note to thank you for your hospitality and to let you know that my family and I enjoyed our recent visit to Kernville. We look forward to coming back at a later time (and later in the season) so we can enjoy more that the area has to offer. We will definitely recommend your houses to our friends as they were very well maintained and convenient to downtown. Thanks again. All best~"
"We had a wonderful time at the Kernville properties! Since we had all four houses, we loved that we were so close together - since we shared all of our meals. Kernville is a very nice town and we found lots to do. Not sure if we would go in August again, however, as the temperature was pretty high! :( The houses were very nice. All were so clean, comfortable and worked perfectly for all of our families. Our 'meeting' place was Big Blue; both inside and on the patio, where there was enough seating at the picnic tables for all 24 of us. The kitchens were stocked with almost everything we needed, so that was nice. The air worked beautifully in all the houses, too. It was nice being so close to town, so we had the option of walking there. We definitely will consider coming back to these properties for our next reunion." "Thanks for everything. This "fishing" vacation was 3 generations of our family getting together, one person we hadn't seen in over 30 years!! We had PLENTY of room and great amenities! We Bar-B-Que'd both nights (no trout, though.......oh well). We had a great time and will highly recommend your services to anyone headed up to your town. Thanks again!!!!" "Dear Carl, I want to tell you how nice it was to stay in your 4 units this past weekend. I am a coach and parent of a student on a high school mountain bike team. We were able to house nearly half our team and their families at your rentals. It was great to have all those kids & their parents together. We were also able to host a spagetti dinner for the whole team on the large patio of Big Blue. I am so thankful I found your place and plan to use it again next year when we have our race at the Keysville Park. Once again, thank you for allowing us to have a wonderful weekend in your houses!" "We had an excellent time in Kernville this weekend. Your cottage Little Blue was an excellent choice for 2 small families. The rooms were neat clean and roomy. The website pictures did not mislead in any way. Everything in the room worked perfectly. Sunday morning looking out the window to see snow falling was the best. Kids had not seen snow falling before and made for excellent picture opportunities and outdoor fun. I would definitley recommend this place to everyone!! " "We had a great time Carl. Me and my family have been coming up to Kernville annually for the last 15 years and have never had a more enjoyable time and you can definitely expect my business from here on out. Thanks again Carl "
"Thank you so much for extending your rental to myself and family! It was so well kept, clean, and provided everything we needed during our stay! We will be visiting the area again shortly, and refuse to stay anywhere else! Your prompt attention and accessibility to book online made our reservation a breeze! Thanks again!!!!" "My family and I very much enjoyed our stay in Big Blue. We stayed in one of the other units 3 years ago and it was just as much fun. Very easy check in and the amenitees made the stay care free and fun. Look forward to coming back next summer. " "We rented West Tobias for the week of July 18th-22nd 2011 and had a wonderful time. The unit was perfect for my husband and I. The neighborhood is pretty, peaceful and very quite. The kitchen was perfect and very well appointed with amenities, we needed nothing except the food we brought. The back patio area was quite large and nice. We have a Subaru Outback and it was wonderful to be able to back it up to the front door in our very own parking spot, for unloading and loading with ease! The view from the living room of the surround hillside and neighborhood was very pretty and relaxing along with the evening breeze. Unfortunately there was a fire north of Kernville, which caused the air to be too bad for my husband with COPD to go out and fish the last 2 days of our stay; but we enjoyed your unit so much we decide to stay several more days regardless. The central location to the river, stores and restaurants within a short 2 block walking distance was an added benefit; you really wouldn't have to drive anywhere else if you didn't want to. Star gazing at night was fabulous right from our driveway. Thank you Carl for making our small vacation so relaxing and enjoyable. We look forward to coming back again for many years to come. " "Dear Carl: Our family enjoyed staying at your rentals so much. It was ideal having 4 homes for the 23 of us. We loved that the kids could go from one house to the other without going out of the compound. There were a lot of fun, adventurous things to do in Kernville, and the location of the homes were so convenient to the stores, river, restaurants, park, etc. We'd recommend your rentals for family gatherings and vacations such as ours. (And we already did.) Thank you so much for the wonderful memories that were created there. All the best, Judy "
"Hi Carl, We enjoyed our stay at your house so much that we all decided to book this house from now on for Whiskey Flats. One of our party is handicapped so the location to town was perfect, the closest we've ever been to town without staying at a motel. Your place is lovely and has moved right up to the top of our list of places to stay in Kernville. We are definitely going to recommend it to all our friends and family when they ask us where they should stay. I was praised all weekend by the couples we went up there with for finding your place and that made me feel great. Thank you so much,"
"Carl, I would like to inform you that my family and I had a wonderful visit in Kernville and we were all very comfortable at the Big Blue. My adult children were thrilled that they had Internet service and Direct TV, not so happy with no cell phone service (which I enjoyed immensely). The town square was decorated wonderfully for the holidays. Everyone we encountered in town was genuinely friendly and helpful with all our questions. My only negative experience was our route on 178 was closed due to rock slides so we were re-routed to the other side of the mountain and arrived several hours later than we expected. We have discussed visiting Kernville again during your high season to enjoy the lake activities. We will definitely keep your rentals in mind when we plan that trip. Thanks again and Happy New Year." "Hello Carl and Family! We arrived around noon in the middle of a late summer heat wave. We stepped into the house to find the A/C on and the house comfortably cool. It was great to find ice trays in the freezer full of ice. We relaxed a few minutes over a glass of iced tea before unpacking the car. Once we were unpacked we headed out to the river park with the dogs. After returning to the house we took a shower. The water up there is amazing. I don't think I have ever felt as clean and refreshed as after taking a nice hot shower in Kern River water. My skin felt like it could breath for the first time in my life. It was a very invigorating and refreshing experience. We ordered a pizza and salad from the local Pizza Barn up there. Mmmm! Very good. Not long after watching a DVD we climbed into our comfortable beds and slept like logs. The next morning we got out to James grocery store. When we got to the meat counter, sirloin steak was on sale that day. OH BOY, my favorite. The meat there is tender and delicious, just fantastic. We ended up having BBQ steaks 3 nights that week. Later in the day we went up to the 100 giants and hiked around that area of huge Sequoia trees. Just breathing the air up there seems to refresh your spirit and sole. Friday we drove up to McNalleys and got some burgers from there little hamburger stand. We didn't feel up to having one of the huge steaks they serve up there after having steak 3 nights during our stay. A burger and fries for each of us was just enough for dinner before our trip home. Can you tell we love it up there? Anyway, looks like I'm writing a book. The house was great. It was close to town and all the restaurants, shops and museum. The restaurants in town all have good food. River park is just another block away. The house was very nice, it had everything necessary for a comfortable stay. We will surely return next year. Thanks for a great vacation! We needed it!" "Carl, We thought Big Blue was just great. We had a wonderful time and have no complaints at all. The cabin was very clean, had plenty of toilet paper, paper towels, kitchen garbage bags, towels, and plenty of kitchen essentials to cook at home. The location was great for walking uptown to eat, drink, antique shop, visit the museum, and just enjoy the park located near the river. My family enjoyed it so very much. If we ever are needing a place to stay when we come back to Lake Isabella area, we'll definitely check out your availability. Have a great day!!" "Thank you so much for letting us stay in your amazing cabin! 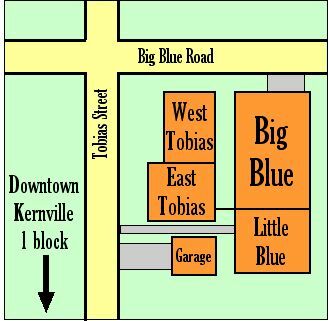 We found East Tobias to be very roomy, comfortable, and convenient. Everyone loved the central location and had a great time. This is the best deal in Kernville!" "Carl, Just have to tell you how much we enjoyed staying at your place in Kernville. The location was perfect, we walked to the Saloon at night, danced to the excellent band one night, sang to Karokee another night. The river was an easy one block walk where we spent the day having a blast inner tubing. The accomodations were perfect, as well. My family of four stayed at East Tobias, my brother and his family at West Tobias, my sister in Little Blue, and my cousin and her family in Big Blue. Two families brought their dogs, which had a little patio area where we barb-b-qued all together at Big Blue using all the picnic tables. The houses were comfy, all the amenities of home, and walking distance to the stores, which we did go buy some antiques one day. A short one hour drive to the Sequoias, this is truly a magical place, and we enjoyed tremendously!!! We definetly will be back, thanks!" "Hello Carl. What a wonderful place, you've got there. These were the most relaxing couple of days, we've had in a long time. Unit by far exceeded our expectations, large, clean, bright, tastefully furnished. Comfortable bed, tons of towels, closet space, dishes, pots, pans, all appliances in perfect working order. Your manager was super nice. And all of these, only within 3 hours from LA. We were wondering what to do for Memorial Day, well this problem is solved, after staying at your place there wasn't even a drop of doubt left about where to go. Just made a reservation for three nights at East Tobias Thank you very much for simply wonderful job you and your staff have done by creating and maintaining such a grate establishment." "Carl, Big Blue was the perfect place for us. We walked everywhere, rafting, restaurants, bars, museum and grocery store. Bar-b-qued on the patio every night. Bought a couple of tubes (everyone sells them) and for each (per trip) up to four trips a day, took the bus with the rafters up to the drop off and cruised down the Kern. Each trip took between 2 to 3 hours (with a few rapids along the way). The best part was were we got out of the water was less than four blocks from the house. Awesome! Will definitely be back next season. It was a blast. Much thanks." "The stay at your comfortable house was wonderful as usual. We hadn't stayed in the summer before and the town is really fun at this time of year. Mom and I got some good fishing in with the river so close my nephew could walk there and swim or fish any time he wanted to. The house was very cool and comfortable and the barbeque got a good workout. That patio in the back was a lovely place to sit at sunset and discuss the days events with children's or adult beverages. We slept with the windows open at night for the cool breezes, to hear the frogs from the river and the wind chimes from next door. Thank you for the wonderful vacation." "Carl, What a wonderful facility! Everything was top notch. My family had a much needed and enjoyable vacation. We hope to utilize it again sometime this summer. " "Once again, we had a wonderful stay at the West Tobias site. The rental is cozy and perfectly located for all of our outdoor activities. Jaime the property manager was extremely considerate and helpful. I have already recommended a few friends and family to stay here when they visit the Kern River. I look forward to renting again. Thank you Dedra Dean, San Fernando, CA. " "Hi Carl, Just completed our second stay this year in Little Blue. It was the same great home away from home as before. Nice and comfortable and had everything we needed. Thanks again to you and Jamie for making this an ideal place for our Kernville getaways. Sincerely,"
"Dear Carl: I just wanted to tell you how much my family and I enjoyed the East Tobias. I was so nice at the end of a long hot busy day on the river to come back and be able to relax as if you were in your own home. This was one time the pictures did not lie. It looked just like the photos on the web site. Which is very unusual. We've stayed at places before because the pictures looked nice only to find when we got there it was the complete opposite. Thanks again, and we will be calling again next year probably for the Big Blue because my other daughter and family will want to come with us." "Thanks so much Carl for letting us use your place. My whole family felt so at home away from home! God bless you!" "Carl, Once again your Kern River Cabins were absolutely perfect. I first stayed at your cabins during our celbration of my sister's fifth year, cancer free. They were perfect for our entire tribe (24-27 I think!) So when I began looking for a place to conduct a Leadership Retreat for our Student Government Leaders, I thought of your cabins first. Again, the cabins were perfect. I was able to accommodate many of the students with individual rooms (a very rare treat!). We gathered at Big Blue for meals and general meetings. Break out sessions were held in different cabins and at the River Park. My students and I had a wonderful time. We worked hard, learned a great deal and had time to laugh, talk and play in the Kern River. It was an experience my students won't forget. Thank You, Jeannine M. (Jan) Moline, Student Activities Coordinator, Cerro Coso Community College." "Hi Carl, The rental WT was perfect for our family's two week vacation in Kernville this summer. We had a wonderful time! The rental was very peaceful, & private. Which is exactly what we were looking for. We'll be back again for more next year. Also thank you again for granting me that special little request that I had prior to our vacation regarding our little family mascot. :) Thank you." "Hi Carl, I would like to thank you for keeping your facility very welcoming. Me my wife and and three kids had a blast, we felt home away from home and what a great town. We've been going up to Kernville off and on for some time now and I think we found the prefect place to stay. Again thank you and we'll see you next year or sooner. Very pleased, Rick, Eileen, Jesse, Christian and Rebecca"
"Thank you so much for the last minute reservation, I had a wonderful time and will be back soon. The house was great and I couldnt have asked for anything else. Thanks again"
"Carl: We had a simply wonderful time. Your places are amazing!!! I have NEVER stayed in a rental property that was so well stocked with kitchen items - and towels. We were all VERY surprised at how well we were treated by you. The place was wonderful and very comfortable. In fact, all three cottages were very comfortable and EVERYONE was really impressed - thank you so much!!!! " "Carl, I wanted to tell you how much we enjoyed our visit to Kernville and how your house was the perfect place for us to stay. We ended up having only 6 (my daughter brought only one friend not two.) We will definitely want to return and my wife and I are even talking about having a family reunion up there with all her siblings and their families -- renting out all four houses! It was very well run; everything was in good repair and clean. The house was also well located; we walked to the Cracked Egg for breakfast the first morning. Jamie let us stay until 2 pm which worked well for our schedule. You should be proud of the fine operation that you have there. Best regards, "
"Carl. Thank you for providing us with a home for a month. The two cottages worked out perfectly for us, even with the 1 hour drive to China Lake each workday. We always had a nice place to come back to, with plenty of room, a kitchen to cook meals and save on expenses, and a wireless network to get our work down. Kernville is of course beautiful and a very pleasant place to play and work. Your manager Jamie was always there when we needed her. As much as we are all ready to go home, we will miss our part time home in Kernville. Thanks. " "I stayed in the Big Blue and the west Tobias. I LOVED them. We came with a group of 12 for a rafting trip. The places were perfect...room for everyone to relax and kick back. The location is perfect so that walking to rafting and meals was easy. I will come back time and time again...I really can not say enough good things about this rental!" "Dear Carl, On behalf of the Stevens party, we would like you to know, how much we enjoyed staying in the West Tobias cottage. What a pleasure it was after our long bike ride to walk into such a warm & cozy place! Thank-you so much for all the thought you and your family put into making this a great experience for all of us... WE WILL BE BACK! p.s. We will be recommending this place to everyone we know!!!!! " "First and foremost I wanted to tell you what a perfect stay we had at your rentals this weekend. We had 23 people and 4 dogs, and there is nowhere probably in the state of California, much less Kernville, that would have fit all of us so appropriately. The people who joined us for the first time this year were as impressed with the rentals as everyone else was last year. Thank you again for everything you have done for us. If you’d have us again, we would definitely be back next year and years following. " "HI Carl.... We did enjoy our stay at "Little Blue". The house is very nicely furnished and comfortable. Liked the privacy and quiet it provided as well with patios. Good for sitting, reading, or enjoying the weather we had when we weren't at the river. Having the gates to close off the yard is a nice feature so Max, our dog could run around a bit. We will definitely come back to your property if we make a trip up there again. My husband and a buddy of his love to fish and have been at other places in Kernville on other trips. This would be a good place for them as well. Loved it's convenient location to town and river park." "Carl, Big Blue was perfect for my family. We needed to get away! The BBQ grill was awesome. Perfect spot to walk downtown. I think you should warn other customers about Tuesday being a day most stores are closed (in the off-season!). That was the only drawback. We had an awesome time otherwise. Looking forward to visiting during the summer. " "Carl - Our family enjoyed our New Year vacation at West Tobias. The walk to downtown Kernville makes the location very attractive (p.s. We loved Cheryl's for breakfast). We spent two days in the snow at Alta Sierra and then had a quick 20 minute trip back instead of the twists and turn through the canyon. We hope to stay up at Alta Sierra on our next visit. Thanks again." "Hi Carl, Thank you so much for having us this last weekend. The West Tobias cabin was very impressive. The location was perfect and we all enjoyed ourselves very much. The other couple that came with us were blown away with the location and are planning another trip up with us. We will be back to rent from you in the near future. Also Jamie was extremely nice and very accommodating to all of our needs. Thanks again and we hope to do business with you again. " "Hi Carl, Thank you so much for the great accommodations at West Tobias. I know you left me a message about ordering the fight, but I couldn't call you back because I had horrible reception at the the lake. It wasn't a big deal, but I really appreciate you looking into it for us. Our stay was wonderful. The rentals are in such a perfect location. We were all very impressed with the house and accommodations. Everything was GREAT! I'm happy to write a testimonial with all of our great experiences for your website. Thanks again for everything. We plan on staying there again and again! " "We only spent a couple of days, but realy liked your rental. It was very convenient to town. It was spacious for five. It had all the towels, bedding, and kitchen ware. It also had direct TV for our nightly viewing. Thanks." "Hi, Carl always nice to speak with you. The place was great, clean, and yes, a nice walk to town and the river. To you newcomers, it is everything you see online and hear about in the other testimonials.. Will return!!!! And will do PR work for you to anyone going up to Kern. Thanks, glad I found your site!!! " "H Carl, I just wanted to write a little note to let you know how much we enjoyed our stay in Kernville. We are a large family (24 of us) that includes young couples with small children, single adults, both young and "not so young", teenagers (boys and girls) and married couples with older children or no children. Needless to say it is often difficult to find a location that will accommodate both the size of our group and the logistics of getting everyone a spot they can feel comfortable in. Your rentals were absolutely ideal! They offered such a flexible layout, all the "grown-ups" felt spoiled with their own rooms and Queen beds, the "big kids" got their own bunk rooms with plenty of space to group by boys or girls, older or younger, and yet the whole family was all right there, close enough to enjoy group activities and meals together. (The large patio and space available in the "Big Blue" cabin worked really well for our whole-family meals!) There were also activities for every taste in the nearby area, we enjoyed everything from the antique stores, to the Giant Sequoias, to Lake Isabella and of course the Kern River itself. This particular family reunion was very special to us, as we were gathering not only just to get together, but to celebrate the fact that my sister has just past her five year survival date since undergoing cancer treatment and is now cancer free. Her cancer had been diagnosed in a very late stage, and the odds of us ever seeing this occasion were not the best. Needless to say this made this particular reunion very important to us, and we wanted everything to be just right. We are so happy we found your site, and everything from the ease of making the arrangements, to the location and great layout, to the terrific "we thought of everything" feel inside the units themselves, all made our gathering everything we wanted and then some. Thanks so much! " "I wanted to drop a note to say thank you. We had a wonderful time. The Whiskey Flat Days parade passed right in front of the house! We didn't even have to leave the driveway! It was great! The weather was also beautiful. My friend Chris in West Tobias won a raffle for a quarter of beef. All cut up and frozen, lot of steaks. He was thrilled. Thanks for everything Carl. We hope to come up again soon." "We had a great time! The location of the house was ideal for walking to town, visiting the museum, or walking to the river. I loved the decor of the house. It made us feel right at home. We'll come back again!" "Hi there, Thanks for allowing us to rent from you. We enjoyed ourselves. You asked if there was anything that could have made our stay a bit more enjoyable so here we go -- Get the Jacuzzi! lol..... We are considering coming back next year if you will have us. Thanks,"
"Thank You! We found Little Blue to be a great place to stay. We have told the rest of our family who have family reunions in Kernville every year. We are already making plans to make another trip for "Whiskey Flat Days" and hope to reserve more of the cottages. " "Hello there! My family and friends stayed in your East & West Tobias rooms over this past weekend, and we just wanted to thank you for providing such outstanding accommodations, we had a lovely stay along with all the comforts from home and more, we look forward to visiting the property again.... and a special thank you to Jamie the property manager! We will definitely be sending future friends and family your way� Sincerely,"
"Hi Carl, We did enjoy our stay in Kernville. Big Blue was perfect for our needs. Because of our changed schedule we ended up with five adults and no children, and the place was plenty large enough... we were able to have another local family over for an evening so we could all be together. The furnishings are pleasant and we appreciated not having to stay in a motel. If we do a get together in Kernville again, we would want to stay at your property again." "My family went out for a holiday weekend and we all agreed this was one of the best places to stay in Kernville. It is a great location and had plenty of room for a large group. The best thing of all was it was a great value for the money." "We really enjoyed our stay. Little Blue is a very nice home. We will definitely be back. Thank you for your hospitality!!" "Hi Carl, I just wanted to let you know that my friends and I had a great time in Kernville this past weekend. The weather was great, the houses were perfect, accomodated our every need, and very roomy. Thanks for everything!" "Your place is great Carl. We really liked how you set up the places. They looked much nicer than the last place we stayed at. I liked how my me and my wife could sit up and watch a movie after the kids went to bed without bothering each other. It was just like home. We want to come back before the end of summer." "Hi Carl, I just wanted to let you know we had a GREAT time in Kernville last week. Big Blue was very comfortable and roomy, Can't wait for our return trip. Thank you again for the lodging accommodations! -- From the Parga Family :)"
"HI CARL, THANK YOU FOR A GREAT PLACE TO STAY AT SUCH AN AFFORDABLE PRICE. WE ARE LOOKING FORWARD TO NEXT SUMMER ALREADY! WE LEARNED HOW TO FLY FISH,WE RODE THE RAPIDS,WE RENTED SEADOOS AT THE LAKE AND WE HAD A GREAT BBQ . BREAKFAST AT MARGIES WAS GREAT,EVERYONE KNEW EVERYONE.YOUR PILLOWS WHERE SOFT AND THE HOUSE WAS CLEAN AND READY FOR US TO RELAX. SEE YA NEXT YEAR!!! Y.L." "This is an excellent place to stay. It was very clean, price is very reasonable and the property is extremely close to all the locations/activities in the area. The owners provided great customer service to us. We would highly recommend this rental property." "Hello Carl.. my family and I had a great time. The place was nice, very cozy... Thanks again,"
This secure website has everything you need to book a memorable vacation. Please visit our Reservations page to register yourself a free account. Visit the Activities page for more details about our area.